The Colonial Inn is the perfect Bed and Breakfast in Gloucester, Massachusetts. Plan your ideal, Cape Ann Vacation with our aesthetically and architecturally pleasing Georgian-style house. Built in the 1850’­s, the Balestraci and Schmidt family has owned and operated this gorgeous property for over forty years. From our cozy B&B, you can take a two-block walk to Niles Beach, as well as a variety of other beaches and coves. Rocky Neck Art Colony is also close-distance; it is the oldest active art colony in the country. No vacation is complete without a delicious meal and some local fair, there’s a myriad of sumptuous restaurants with something new to try, so be sure to check out the nearby eateries during your stay. For the outdoors lovers, we’re located close to docks and fishing boats. 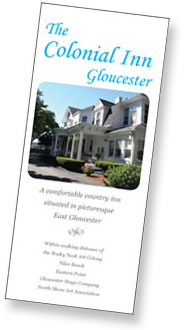 Gloucester has a lot to offer the nature lover, with sights and sounds from this ocean-side community. Also in a two-block walking distance is the Gloucester Stage Company – co-founded in 1979 by award-winning playwright Israel Horovitz. Under his artistic direction, the GSC has produced numerous plays, more than 35 world premieres, 50 American premiers, and 75 New England premieres. While staying with us, you’­ll be close enough to venture to downtown Gloucester or to the other communities of Cape Ann, the Town of Rockport, or to the towns of Essex and Manchester by the Sea, all within minutes. Relax with us; enjoy the ocean-side view and the ever changing panorama of picturesque Gloucester. For more information on planning your Cape Ann vacation, contact us today!